Kurt Cobain was a tragic genius. Gone far too soon by his own hand, the world lost one of it’s greatest writers. For how short of a time he was in pop culture’s view, he left an indelible mark. As the lead singer of Nirvana, he brought the Northwest grunge sound to the mainstream, and influenced an entire generation of rock fans. “Smells Like Teen Spirit” is one of the greatest rock songs ever written, and yet he hated it and for a time refused to play it. He wrote it to be the perfect pop song, and resented that it actually worked. The music video that would accompany it became an iconic image of 90’s rebellion, and of alternative rock. 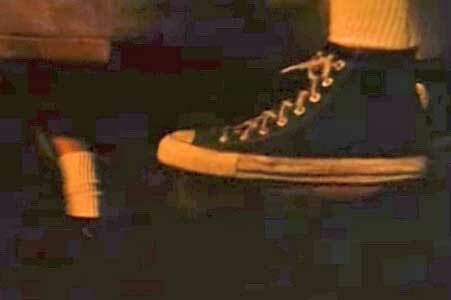 The very first shot of this video is a close up of black high top chucks. 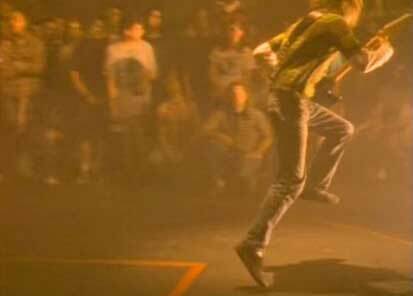 “Smells Like Teen Spirit” opens with an establishing shot of Chuck Taylors on a set of bleachers in a high school gym. The camera pans to Nirvana playing amidst cheerleaders wearing a scarlet letter on their chests. The crowd in the bleachers is headbanging throughout, and eventually forms a mosh pit right in front of Cobain. The mosh pit escalates and escalates until the band is overcome by the crowd, who starts to tear down the very gym that they’re in. With the crowd out of hand, and Cobain smiling hysterically, the video ends. Wearing chucks in the mosh pit. Chucks seem to be the unofficial shoe of this video. Cobain is wearing a pair of low top all black chucks that we get to see as he leaps around the makeshift performance area. Many of those in the crowd are also wearing chucks, as we see with that opening shot. We also see a man wearing the same pair as Cobain as he crowd surfs the mosh pit. With their prevalence in this video, it’s not so shocking that chucks became a favorite shoe of alternative rock for years to come. This video is engrained in the mind of pop culture, and was a seminal moment for music and an entire generation of rebels. Kurt Cobain wearing chucks and leading his misfits. Rock out in a pair of chucks by clicking on the links below.